★【MATERIALS AND SIZE】 - The cable organizer Made of Microfiber material with hook & loop attachments; These cable ties wraps are both reusable and durable. The size of Wire Organizer is 7 inches length and 0.7 inches in width. ★【FLEXIBILITY & VERSATILITY】 - Multiple cable ties can be attached together to form one longer cable ties. These wire organizer are durable and flexible enough to tie up all of your cables or wires securely. ★【EASY TO USE】 - Organizing cables can be easier. You do not need to trim it. The cable organizer wrap opens and closes easily and quickly so you can add or remove cables or wires. 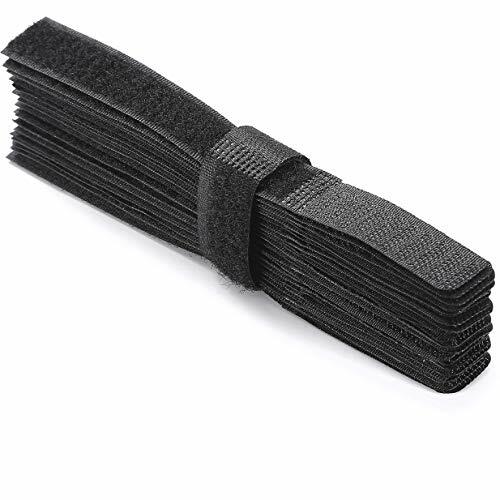 ★【GREAT PURPOSE】 -This cable ties can be used to tie up speaker cables, guitar cables, TV cables, smart phone MIC, computer cables or wires cord etc. The wire organizer management all kinds of cords cables well organized and tidy in place and is reusable and easy to make marks. ★【100% REFUND】 - no risk to purchase. Click this Cable Wire Organizer Cord Ties to add to cart to experience a new life and fit. If you any questions， please contact us, we can provide the best service for you, Thank you!